On my way home from work a few weeks ago, I noticed an excessive amount of activity around one of my large hives. When I stopped to take a closer look, I recognized the tell-tale signs that a robbery was in progress: insane traffic at the entrance, frenetic zig-zagging, and too much interest at the back and underside of the hive. I immediately closed down the hive. When I came back at dusk, all seemed to have settled down, so I drastically reduced the entrance down to a two-bee space and went to work the next day confident that I had dealt with the problem, at least for the moment. My trip home past the hive the next day was discouraging, to say the least. The marauding bees had actually managed to push out my entrance reducer; the entrance was sticky with wax and honey. Again, I shut down the entrance. An inspection just before dusk revealed that there was little of my large beautiful colony left; not only were its honey supers pillaged, but its brood area was nearly non-existent. Clearly, this hive’s troubles started before the nectar dearth. The last entry in my record book for this colony was before my travels to the Midwest. 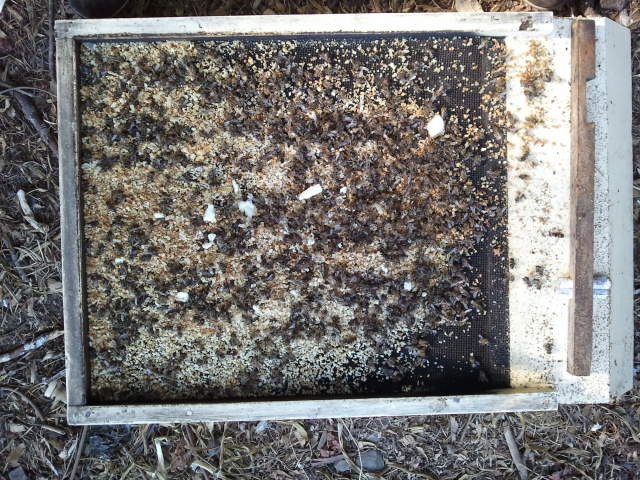 In early July, it was a large colony with a young, vigorous queen and a growing honey surplus. When I visited it before my trip in mid-July, it was so ill-tempered I was only able to inspect the top three of its six boxes before having to close it up. Time didn’t allow a second attempt before I left for my trip. Looking back, I think perhaps the queen must have failed (or I injured her in early July), and the colony was faltering even before I left. Had I put it first on my list to inspect upon my return, perhaps I would have been able to save it, or at least salvage its stores. As it stands, I will have to count the loss of this colony a painful lesson learned. Sorry about your lost hive Kelly. So far I have been lucky with that problem this year. Keeping my fingers crossed. Most of mine are ready for winter. (at the moment) I am still feeding 4 nuc.s and one full size colony. Hope the remainder of the season treats you better. Thank-you for the sympathy. : ) In addition to missing a critical clue as to the condition of this colony, I also ran short of the robber screens I have on my other hives (entrance reducers are NOT the same in my book.) I’m afraid this was just the natural consequence of my not being on top of things. Glad your hives are well, Max!